Being stable and level is one of the most important aspects of angling. 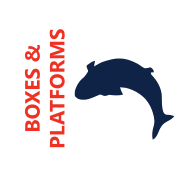 You must trust your box or platform 100% particularly when out in the water. We have a great range of Fishing Boxes and Platforms to suit any venue.